You can utilize a vacuum beard trimmer to trim your beard while keeping your shaving area clean. A vacuum on your trimmer will take in all those annoying beard shavings that are normally stuck around your sink after you are done. You’ll have a clean feeling all around your face when you are done shaving. 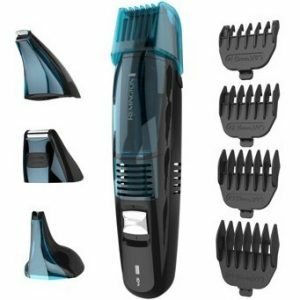 There are many models for you to choose from, but you should look carefully at the features that come with the best vacuum beard trimmer models. Each trimmer is different in many ways. You must look at how well each model works and how well you can handle whatever you plan on using. What Are Vacuum Hair Clippers? 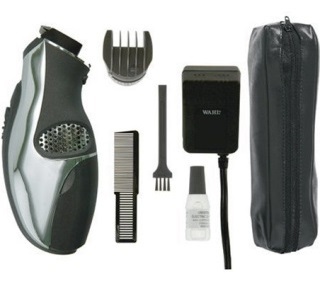 A vacuum hair clipper set is a model that uses a vacuum fan that collects hair that the clipper trims. The design is intended for keeping your shaving area clean while also producing a consistent cut. 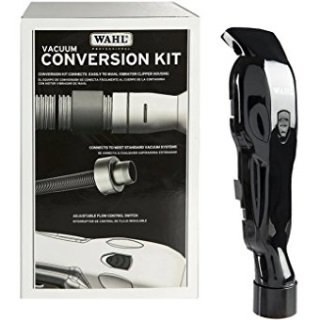 The vacuum operates with a small container attached to the base of the trimmer. You can remove the container and clean out the hair that you cut. The vacuum can take in any kind of hair that you trim, including hair from your sideburns among other thick or coarse spaces. The main intention of vacuum hair clippers is to keep your shaving space clean and easy to maintain. The risk of hair falling on your sink will be minimal. Also, a clipper set may be used while on the go without worrying about leaving hair all around. You could use these clippers at an airport or other location where you require a quick shave. Your first option for the best vacuum beard trimmer comes with a built-in length adjuster. The design controls the length at which your hair is being cut, a must for when you’re trying to keep a beard while maintaining a sensible length. The control gives you the extra help you need with producing a fine trim. The trimmer blades start by lifting the hair. After this, the blades capture the hair and produce a clean cut. The performance prevents ingrown hairs from developing. The control knob on the bottom gives you twenty length options. You can move the knob to adjust the blades to work based on a length that is right for you. 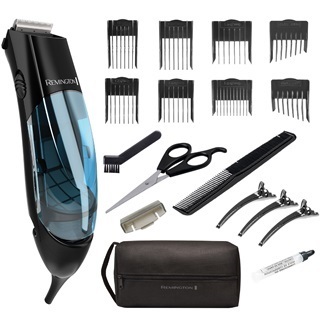 The three added guide combs and the precision trimmer attachment add a useful touch. The stainless steel surface on the blade produces a clean cut that moves through every hair. The attachment combs also provide enough coverage over even the longer bits of facial hair. Each comb is made with a sturdy plastic material that will not wear out during your shaving task. I did not feel anything rough coming out of the cutting surface. My hair was trimmed all the way without any bits of hair being caught. I certainly did not feel any unwelcome pulling or tugging. The control knob was also very responsive as I adjusted it to get the cut I wanted. The battery is a feature I was very impressed with. I can get the battery charged up in about an hour. Even more intriguing, the battery works for up to 80 minutes depending on the functions used here. I can also use the precision trimmer on this model for the closest and most detailed spots that I need extra help with. The vacuum still works near the trimmer spot. Although the attachment combs are useful, they are not adjustable based on length. I would have liked a little more customization in those combs for my convenience. Remington makes this next vacuum beard trimmer with an extensive assortment of attachments. Each piece on this model gives you more control over your grooming experience. 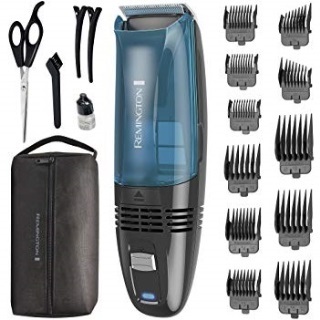 You can use the trimmer with one of eight comb attachments, including some options that work for the left and right ears. Six lengths are utilized within these guide combs, including ones close to half an inch. There are several other pieces in this set, including a styling comb and shears, three sectioning clips, and a full cover for the blade when not in use. The brush is small enough to provide a firm handle over the cleaning process. The fan for the vacuum produces enough power to take in more hair. The strong design ensures the hair you cut is cleaned out and will not spread all around a room when shaving. The fan is powered by a motor that is separate from the one that triggers the blades for your cutting use. As useful as the vacuum is, I was more impressed with how easy it is for me to clean off the trimmer. The blade on the top comes off in moments. The blade keeps working even after I soak it in a cleaning solution for a few bits. I love how the blade is easy to oil and brush off as well, thus keeping me from wasting too much time with getting the surface covered. The oil does not smear as I apply it. The stainless steel blades were also easy on my skin. I felt the blades lifting my hair and providing a clean cut. I like how the blades don’t cause irritation or redness. The comb attachments were very easy for me to incorporate in my cutting efforts. I can use these combs to handle various longer bits of hair. The battery takes a while to charge up. I have to wait a few hours before I can get the battery to start working all the way through for me. 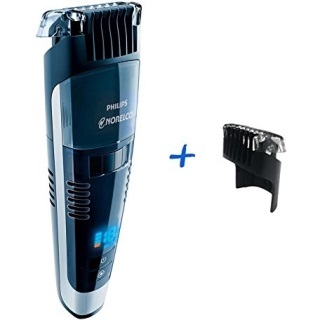 You will find that the third choice for the best beard trimmer with vacuum functionality has various helpful attachments for your convenience. The Remington HC6550 offers several combs that keep the trimming process running smoothly. 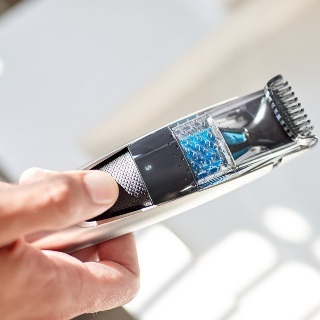 The trimmer uses a series of titanium-coated blades to produce a firm cut every time. Titanium is known for being one of the toughest metals you can trim with. Eleven comb attachments are included at multiple lengths. Some combs include bristles that descend in length as you go along their bodies, thus producing a fade effect. Such combs work best for detailing. The attachments can be snapped to the top part of the trimmer to give you more control over your work. The vacuum attachment on the base offers a clear view so that you can figure out how much hair is being collected while you shave. The eject button is under the vacuum container. The shavings are kept secure within the container and will not spill out after you eject for cleaning. The rechargeable battery takes about four hours to power up. The battery works for about 60 minutes on a full charge. A battery indicator lets you know when you need to recharge the unit. The vacuum was very comfortable and did not bother me when I was trimming my hair. The vacuum did well with collecting the hair without irritating my skin. The blades were comfortable on my skin and did not cause any redness. The trimming shears were also helpful with giving me control over some of the longer bits of hair that I needed extra help with. The tapering combs were very useful. I appreciate how diverse the attachments are. These combs come in multiple lengths for when I need help with getting some of the longer bits of hair that I struggle with trimmed. The combs also keep my hair straight. It was not hard for me to make this model work. The handle does not offer much of a contour. I would have like this model more if the body had a better curve to it so it could fit better in my hand. This next Remington model focuses on versatility. This works on more than just your beard, as this is a 4-in-1 set. You will find that the Remington VPG6530 offers more cutting options for your convenience. Each cutting method works with the same vacuum to clear out your hair in moments. The VPG6530 uses four separate attachment heads. These are designed for use with different cutting intentions. Some attachment heads work for the sideburns, while others are for narrow spots like the brows or around the nose. Each attachment head can be washed off and oiled in moments. The vacuum feature works regardless of which attachment you use. The vacuum and trimmer blades operate on two separate gears, thus helping them operate at the right speeds. The hair chamber is also easy to remove from the base. The chamber can be cleaned out in a few moments to keep the trimmer hygienic. The power produced by the lithium-ion battery creates maximum torque to the motor. The added power gives the trimmer an enhanced setup for clearing off hair. I was impressed with how well each of the attachments in this set work. I like how I can get different cuts managed with individual cutting combs. The designs were helpful for many parts of my hair. The trimmer kept on working at the same speed to give me extra power over my cuts. I like that the trimmer did not slow down when I started using it on some of the coarsest bits of hair around my face. Also, the attachment combs were easy to adjust and plan out. The battery lasts for a while too. I did not notice the battery being drained any faster by a single attachment, so it looks like the battery life will be consistent no matter what I use. I did not like how the handle felt. While I can keep a good grip, the handle feels unusual without much of a bend on its surface. This makes it tough to position. Philips Norelco is a trustworthy name in the personal care industry. 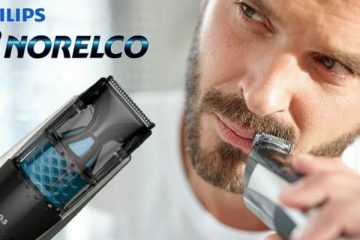 The company has produced a vacuum beard trimmer that looks like it came from the future, but there is much more to this model than meets the eye. One thing you might notice when seeing this Philips Norelco trimmer is its digital display on the bottom part. This special display gives you an approach that helps you control how long your cut will be. The digital display shows the specific cutting length you will utilize. There are 18 length settings on this model from 1 to 18 mm. You can also use a separate 0.5 mm length if you want to produce a slight stubble effect. The vacuum will pick up your beard hair no matter what length setting you use. The vacuum works alongside a few vents to gently pick up your hair without irritating your skin. You can also use the Turbo button on the bottom part to keep the trimmer running a little faster. The button triggers the cutting motor and vacuum fan. A travel lock is included for keeping the trimmer from starting up while in storage. The feature is important for when you’re trying to transport the trimmer with you while traveling in any place. I was surprised to see that the lithium-ion battery can last as long as it can. The battery works for about 75 minutes on a full charge. I only needed one hour to charge up the battery too. The controls on the bottom were easy to use. I can switch between cutting lengths in a few bits. The Turbo button was also convenient for when I was moving through some of the toughest spots on my face. The stubble feature was my favorite part. I like to get a small bit of stubble going, so the added stubble control setup was helpful for giving me a nicer trim all the way through so I could look fresher and a little manlier. The battery seems to run much faster when I use the Turbo button. Also, the vibrations produced by the trimmer seem more intense as I use that mode. Wahl makes this next model with a different standard. The design links up to another appliance in your home for quick cleanup and functionality. To use this, you will have to charge the clipper’s battery and then secure this to a vacuum hose. Connect the hose to the bottom part. A dual vacuum adapter is included with the clipper if you need extra help with securing this to a vacuum space. The design ensures that the trimmer will be linked to a vacuum that collects what you shave. The design produces a complete setup that keeps your hair from causing a mess as you get a full trim going. But don’t forget about the functionality of the clipper beyond its vacuum connection. The motor works on a blade that trims your hair evenly with every pass. The ergonomic handle offers a comfortable design that includes a power button featured on the bottom part. The button is easy to activate. The steel teeth on the blade provide you with a firm cut every time. The teeth are self-sharpening units that work every time. I was able to get the attachment to link to my vacuum cleaner in a few moments. The installation part was easy, but the process of trimming with this Wahl model was even easier. The comfortable handle gave me a simple approach to trimming. I had a very easy time with cleaning the trimmer. The blades are easy to brush off in moments. I can also use oil on the blades if desired. The oil will not impact the vacuum or the hose. The tight seal on the connection gives me the confidence to keep trimming my hair without fear. The blade lever on the top also helps me with adjusting the cutting length. I can change the setting in moments. The idea of trimming my face with something that fits on a vacuum is somewhat unusual to me. It was hard to get used to the process of using this model. 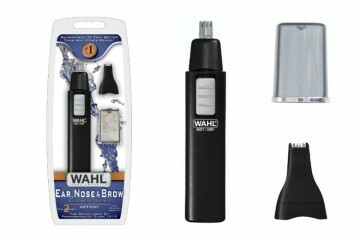 Your last choice for the best vacuum hair clippers is this portable model from Wahl. The Trim N Vac uses a small body that works with or without a cord. The trimmer includes a beard regulator that operates at eleven positions. You can unlock the regulator, set the proper position for trimming, and then place the material at the right length. The steel blades on the Trim N Vac will cut your hair at the length you desire. The vacuum compartment offers an open space near the cutting teeth to clear off the surface in moments. The compartment has enough room for all the hair you trim within a single shaving session. You have the option to use this with either a rechargeable battery or with the cord plugged in for consistent energy. You can use the former option for portable needs or the latter for when you’re using this at home. The battery lasts for about 45 minutes when you aren’t using the cord. The power switch is positioned around the thumb. The design produces a firm body that you can hold in either hand. The grip on this trimmer is my favorite part. I like how the grip offers a comfortable surface while giving me some extra support all around. The metal cutting teeth are easy to clean off. The teeth are wide apart to give me enough control over the cleaning process. The blade looks a little wider than usual, which is a good plus. Also, the brush that comes with the trimmer works well for both the main body and for the small attachment head included. The battery itself lasts for a while. You can use the battery for about three to five years before it dies out. The battery also takes a few hours to charge up, although the charging time is not overly long when compared with other models. The opening on the vacuum compartment seems rather small in size. It is tough to get the port open to clean it out as well. The debris won’t spill when you open it though. The vacuum must be placed close to the cutting head so it can collect your hair. The vacuum should have enough room to handle all of your hair. The suction power must also be strong enough to handle what you cut. The opening for the vacuum container should take in your hair with ease as well. Don’t forget to see how well you can clean out the container without hair coming out while doing so. The motor included in your vacuum trimmer is critical to its success. Specifically, you might find two motors in your clipper set. One motor may work for the trimmer function, while the second motor powers the vacuum. Having two motors provides you with more control over the cutting process. The risk of your trimmer running out of power or slowing down when you reach longer bits of hair should be minimal. The attachments on your trimmer cannot be ignored. Your trimmer may come with several attachments that cover specific types of hair. You can use some long-hair attachments to cover the toughest to trim spots. Some blending or detailing attachments may assist you with trimming specific effects around your hair. 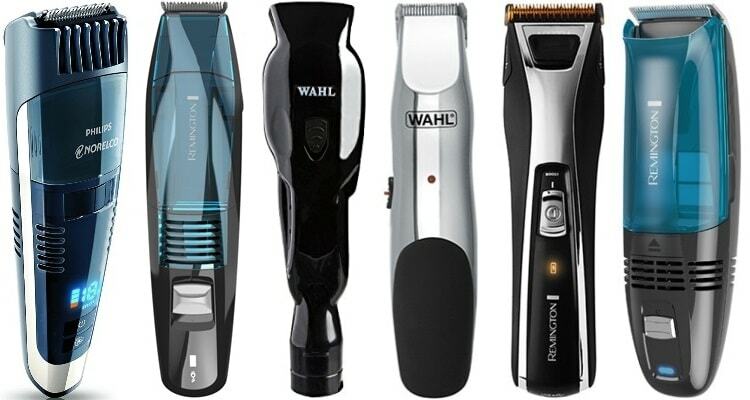 Some high-end attachments feature unique cutting heads that target slim or narrow spots around your face to give you a clean shave. The blades must be strong enough to cut through your hair in as little time as possible. The blades need to be firm and strong enough to get through long bits of hair. Some blades may be a little closer than others. Don’t forget about how any extra attachments are built. Stainless steel has become a standard for some manufacturers, although ceramic or titanium materials may work. Either way, you’ll have blades that will last for years if maintained well enough. The handle on a vacuum trimmer may feel different from what you would get out of a traditional trimmer. A vacuum trimmer may come with a slightly bulkier body, what with it needing to handle a full vacuum compartment. But the handle can come with a small groove or bend in its body. A quality model should also fit in either hand so you’ll have a comfortable fit. Check on the battery on your trimmer before you start using it. Look at how the battery operates on your trimmer. The battery needs to have enough power to go through your face and provide you with a full shave. The good news is that many trimmers operate with around an hour of battery power. Some models can be plugged into a wall and used from there. Review how long it would take for you to get a battery powered up all the way as well. My choice for the best vacuum beard trimmer is the Philips Norelco Beard Trimmer BT7215/49. This is a helpful model that offers a simple design and easy to handle body. The assorted attachments provide an easier approach to trimming specific parts of the body. I also like how the battery lasts for a while and does not take much time to charge up. 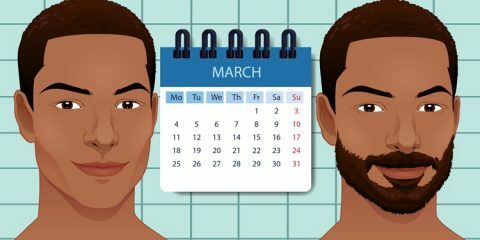 All of the vacuum beard trimmers you have read about here will help you with providing a comfortable cut every time. You will love all of these trimmers, but you must ensure whatever you use works for your grooming demands.